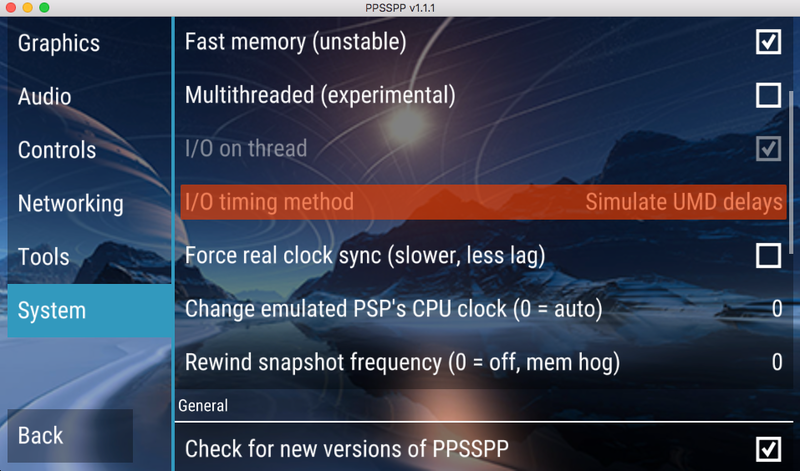 PPSSPP - How to set the "I/O timing method" setting? I was trying to make Bejeweled 2 to work on PPSSPP on both RetroArch core and also on official standalone 1.1.1 version. How can I configure that option for RetroArch’s PPSSPP core? Have you looked if there is such an option under F1->Quick Menu->Core Options? If not, I’m afraid there isn’t any option for it yet. Right, this option is still not available in Core Options menu. Please add this option to RA core. We need “Simulate UMD delays”! Meaning problems got help by changing I/O timing method to "HOST" or"Simulate UMD delays".